David Yutaka Ige (/ˈiːɡeɪ/; born January 15, 1957) is an American politician serving as the eighth governor of Hawaii since 2014. A Democrat, he previously served in the Hawaii State Senate. In the 2014 gubernatorial election, he won the Democratic primary by defeating incumbent Governor Neil Abercrombie, and won the general election by defeating former Republican Lieutenant Governor Duke Aiona. He won re-election to a second term in 2018. Ige was born and raised in Pearl City, Hawaii, and is the fifth of six sons of Tokio and Tsurue Ige, ethnic Japanese Americans of Okinawan descent. During World War II, Tokio served in the 100th Battalion/442nd Infantry Regimental Combat Team and was awarded the Purple Heart and Bronze Star. After the war, Tokio Ige worked as a steelworker on construction projects while Tsurue Ige worked as a nurse and dental hygienist. Tokio Ige died in 2005 at the age of 86. Tsurue, now retired, resides in Pearl City. David Ige attended public schools in Pearl City – Pearl City Elementary School, Highlands Intermediate School, and Pearl City High School. He also participated in community sports, beginning with eight years of playing in the Pearl City Little League. At the newly built Pearl City High School, Ige excelled in many activities. In his junior year, he was elected student body vice president, and he served as senior class president the following year. His campaign for student body president stressed diversity and an end to bullying. Ige also led his varsity tennis team to a championship and was honored as the “Scholar-Athlete of the Year.” He graduated fifth in his class of more than 500 students in 1975. Despite being accepted into the Massachusetts Institute of Technology, Ige attended the University of Hawaii at Manoa, where he earned a Bachelor of Science degree in electrical engineering. While at UH, he served as student body secretary and an officer of several honor societies as well as treasurer and vice-president of his fraternity, Phi Delta Sigma. The University of Hawaii is where Ige met his wife, Dawn, with whom he has three children: Lauren, Amy, and Matthew. After college, while working for GTE Hawaiian Tel, Ige took graduate courses at UH and earned a Master of Business Administration degree in decisions sciences. In 1986, Hawaii Business Magazine named him one of the university’s Top 10 MBA students. Prior to being elected governor of Hawaii, Ige served as project manager with Robert A. Ige and Associates, Inc., Vice President of engineering at NetEnterprise, and senior principal engineer at Pihana Pacific, which established the first world-class data center and carrier-neutral Internet exchange in Hawaii and the Pacific. Before that, he worked as an engineer for GTE Hawaiian Tel for more than 18 years. Ige was originally appointed to the Hawaii House of Representatives on December 2, 1985, by Governor George Ariyoshi, after Representative Arnold Morgado resigned to run for a seat on the Honolulu City Council. He served in the Hawaii State Senate from 1995 through 2015. During his legislative career, Ige has served as the chairman of nine different committees. He focused much of his career as a legislator on information and telecommunications policy. In the Legislature, he co-authored the Hawaii Telecommunications and Information Industries Act that established the state information network and created the Hawaii Information Network Corporation. He has also been at the center of Hawaii’s efforts to diversify its economy. Ige was responsible for establishing seed capital and venture capital programs, software development initiatives, and technology transfer programs. Ige won reelection to the Hawaii State Senate in 2012, after defeating Republican challenger and former U.S. Naval Air crewman, Army Captain, and small business executive Mike Greco. Greco was the first challenger Ige faced in a general election in over a decade. Ige ran against incumbent Neil Abercrombie in the Democratic primary for the 2014 gubernatorial election. Though he was outspent in the race by the incumbent, Ige defeated Abercrombie by 66% to 31%. Ige’s victory made him the first candidate to ever defeat an incumbent Governor of Hawaii in a primary election. Ige faced Republican Duke Aiona and Independent Mufi Hannemann in the general election. He won the election by 12 percentage points. Ige was sworn in as the eighth Governor of Hawaii on December 1, 2014, with Lieutenant Governor Shan Tsutsui, in the Hawaii State Capitol Rotunda. 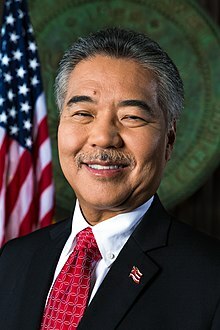 Ige is the second person of Japanese descent to be elected Governor of Hawaii (the first being George Ariyoshi), and the first person of Okinawan descent to be elected governor of a U.S. state. Governor Ige’s inauguration theme of “honoring the past and charting a new tomorrow” was on display throughout the ceremony, which paid tribute to his father who served in the 100th Battalion, 442nd Regimental Combat Team of the U.S. Army during World War II alongside the late U.S. Senator Daniel Inouye. In October 2015, Ige declared a state of emergency due to the escalating scale of the homelessness problem; in 2015 Hawaii had the highest rate of homeless persons per capita in the United States. In June 2017, following President Donald Trump‘s decision to withdraw the United States from the Paris Agreement on climate change, Ige signed two bills that respectively committed the state to meeting regardless its greenhouse gas emission targets under the Paris Agreement and established a carbon reduction and soil health taskforce. After an incoming missile alert was erroneously sent to all smartphones in the state and broadcast over local television and radio on January 13, 2018, Ige apologized for the mishap, which he attributed to human error during a shift change at the Hawaii Emergency Management Agency. Ige pledged to reevaluate the state’s emergency procedures to prevent a recurrence of the false alert, which caused widespread panic and confusion in the state. ^ “DAVID IGE, GOVERNOR, STATE OF HAWAII”. Governor David Ige. November 6, 2014. Retrieved September 1, 2017. ^ “Roll Call”. 100th Infantry Battalion Veterans Education Center. Retrieved December 14, 2014. ^ “Governor’s Bio”. governor.hawaii.gov. State of Hawaii. Retrieved December 14, 2014. ^ Markrich, Michael; Chinen, Karleen (July 16, 2014). “The Great 2014 David Vs. Goliath Match-Up”. The Hawaii Herald. Retrieved August 11, 2014. ^ Kakesako, Gregg K. (December 2, 1985). “Ariyoshi Fills Two Seats in House of Representatives”. Honolulu Star-Bulletin. p. A3. ^ a b “Sen. David Ige announces candidacy for governor – Hawaii News”. Honolulu Star-Advertiser. Retrieved August 10, 2014. ^ a b “Meet David Ige, the Democrat who defeated Hawaii’s governor – OnPolitics”. OnPolitics. Retrieved September 20, 2014. ^ “Mike Greco Greco for Senate”. Facebook. Retrieved September 20, 2014. ^ “Kanu, Hawaii newspaper”. Kanu Hawaii. Retrieved September 20, 2014. ^ “Sen. David Ige enters race for governor”. KHON2. July 9, 2013. Retrieved August 10, 2014. ^ Bussewitz, Cathy (August 10, 2014). “In stunning defeat, Hawaii Gov. Abercrombie ousted by state Sen. Ige in Democratic primary – 8/10/2014 12:52:20 AM”. Newser. Newser. Associated Press. Retrieved August 10, 2014. ^ Cathy Bussewitz and Juliet Williams (August 10, 2014). “Hawaii’s governor ousted in stunning primary loss”. Associated Press. Retrieved August 10, 2014. ^ Sullivan, Sean (August 10, 2014). “Hawaii governor loses primary; Schatz holds slim lead over Hanabusa for Senate”. Washington Post. Retrieved August 14, 2014. ^ Scheuring, Ian (November 4, 2014). “Ige defeats Aiona to win Hawaii governor’s race”. Hawaii News Now. Raycom Media. Retrieved December 14, 2014. ^ a b Lincoln, Mileka (December 1, 2014). “David Ige sworn in as eighth Governor of Hawaii”. Hawaii News Now. Raycom Media. Retrieved December 14, 2014. ^ Shikina, Rob (November 6, 2014). “Okinawan newspapers cover Uchinanchu Ige’s win”. Honolulu Star-Advertiser. Retrieved December 14, 2014. ^ “Governor of Hawaii declares state of emergency for homelessness”. Al Jazeera America. Associated Press. October 17, 2015. Retrieved June 7, 2017. ^ Bromwich, Jonah Engle (June 7, 2017). “Defying Trump, Hawaii Becomes First State to Pass Law Committing to Paris Climate Accord”. The New York Times. Retrieved June 7, 2017. ^ Rosa, Jolyn (January 13, 2018). “Ballistic missile warning sent in error by Hawaii authorities”. Reuters. Retrieved January 13, 2018. ^ Mark, Michelle (January 13, 2018). “The false Hawaii missile alert was caused by an employee pushing the wrong button, governor says”. Business Insider. Retrieved January 13, 2018. ^ “Hawaii Governor Election Results”. The New York Times. ISSN 0362-4331. Retrieved December 29, 2018.